A stand-out infrastructure project that blends architecture and art. The LMN Architects-designed Sound Transit University of Washington Station - UW Transit Station - in Seattle recently received a 2018 National Honor Award for Interior Architecture from the American Institute of Architects (AIA). Seattle people have a new, combined transport hub - the Sound Transit University of Washington Station - at the busy and problem-filled intersection of Montlake Boulevard and Pacific Street, knitting together lots of different modes of transport, from bike to bus to pedestrians to trains. The new 14,492 square metre station is a real enticement to use public transport and provides a unique gateway to the UW campus through its above and below-ground experiences. 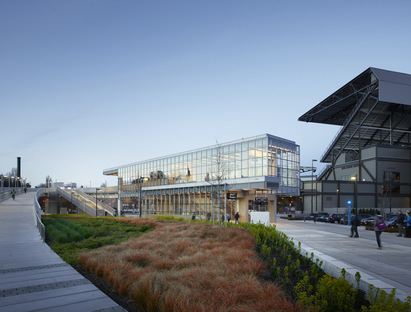 The award-winning practice LMN Architects (link - http://www.floornature.com/blog/lmn-architects-wins-2017-national-aia-honor-award-regional-u-12344/) is based in Seattle so it is fully cognizant of the various local problems. The focal point of this project lies in the creation of a sense of movement and connection with the urban project. This runs throughout the station in a continuous interaction between interiors and exteriors, also helping to orient users. 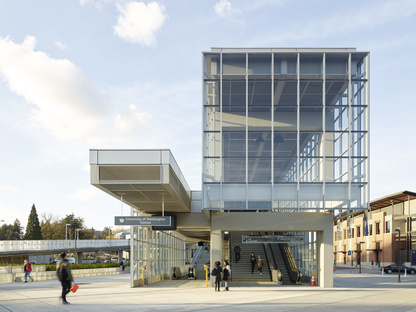 The multi-level station greets users with a 2-level glass entrance, which LMN Architects designed to frame views of the surrounding context, including Lake Washington and the Cascade Mountains. The transparency of this structure also acts as a light well, allowing natural light to reach down to the mezzanine level. At the heart of the station experience, the escalators and glass elevator pass through a 10.6-metre high central chamber. Here, LMN Architects and artist Leo Saul Berk collaborated to create an integrated experience for travellers, where the architecture seamlessly merges with Berk’s artwork, Subterraneum, that expresses the geological layers of soil surrounding the station walls. A very compelling concept, as we can see in Kevin Scott's photographs. This idea, together with the ceramic wall tiles on the mezzanine level and the ticket machine areas with energetic green motion lines, resulted in the 2018 National Honor Award for Interior Architecture from the American Institute of Architects (AIA). Clearly, the many other design solutions adopted with a view to improving the use of the infrastructure and to reducing environmental impact also helped. On the surface, the station’s new bicycle and pedestrian bridge, with stairs, escalators, and ramps connecting both levels of the entrance structure, curves gently as it spans over Montlake Boulevard to connect with the Rainier Vista on the university campus. The bridge plays a critical role in expanding Seattle’s bicycle commuter network, connecting the Burke-Gilman Trail with a new bike lane on the rebuilt State Route 520 floating bridge. 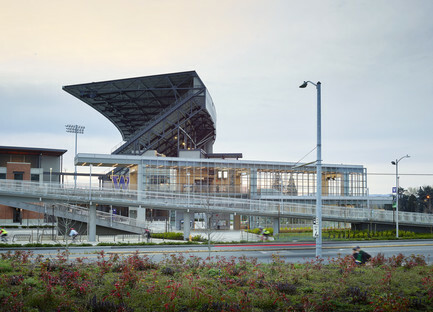 Each element of the new UW Transit Station is carefully considered as a component of a larger whole, set within a complex web of uses that encompasses the campus, the surrounding neighbourhoods, and important university destinations such as Husky Stadium, the Alaska Airlines Arena, Rainier Vista, and the UW Medical Center. Fundamental for the success and actual use of the structure. Train passengers can now reach downtown Seattle in six minutes, and the SeaTac International Airport in roughly 40 minutes.